(Bloomberg) -- President Donald Trump’s threat to close the U.S.-Mexico border to block immigration may not work even if he does decide to act, because four-in-five migrants already avoid the checkpoints he’d shut down. 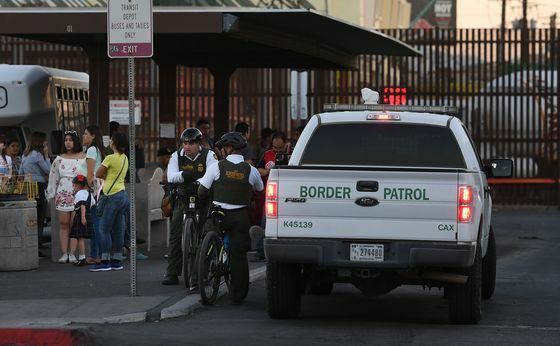 The southwest border is witnessing the greatest surge in migrants since 2014, but then almost twice as many undocumented immigrants went to official ports of entry, Customs and Border Protection statistics show. This time, the influx has been harder to manage because so many are skirting the ports and instead trekking across deserts, mountains and rivers, many tethered to human smugglers. Trump has rejected former President Barack Obama’s use of economic diplomacy, betting that making it harder to qualify for political asylum in the U.S. will act as a deterrent. This week, his administration moved to expand a program designed to return migrants with pending immigration proceedings to Mexico while they wait for their cases to proceed -- leaving them in limbo given the enormous backlog before the courts. That program is already facing a legal challenge from the American Civil Liberties Union filed in February, after Homeland Security Secretary Kirstjen Nielsen first announced plans to expedite the return of migrants to Mexico in December. A federal judge said at a hearing in San Francisco last month he’s concerned the policy will subject them to more of the very persecution that led them to flee. He’s expected to rule soon on whether to block the policy, which the ACLU argues raises the risk for migrants of being kidnapped, trafficked, sexually assaulted or murdered. If the initiative remains in place, it could trigger an unmanageable population explosion along the Mexican side of the border, according to Adam Isacson, of the human rights group Washington Office on Latin America. That would lead to a backlash similar to what happened last year when Trump cracked down on illegal border crossings by separating some 3,000 migrant children in detention from their parents, the defense oversight director said. Trump is already facing blowback over the economic strife that would be felt on both sides of the border if shuttered ports of entry block goods from freely flowing between the U.S. and Mexico. The mere threat of a shutdown caused the price of Hass avocados from the heartland of Mexico to jump 34 percent on April 2. Assembly lines at American car factories would come to a halt once automakers dependent on Mexican imports, which is almost all of them, run out of parts, said Kristin Dziczek, vice president at the Center for Automotive Research. Americans returning from vacations or commuting across the border for work could also potentially be stuck until the border re-opens. On Tuesday, Trump refused to rule out closing the border. DHS has already deployed hundreds of federal agents to the border to respond to the surge in migrants, while promising further reinforcements in the days to come, DHS said this week. Trump also said the U.S. should cut off more than $500 million in aid to Honduras, Guatemala and El Salvador for failing to stop the flow of migrants. Critics say the administration should instead be looking at ways to address violence, economic turmoil and climate change in those countries. The administration has also slowed its plan to hire more immigration judges, according to Ashley Tabaddor, president of the National Association of Immigration Judges -- a crucial step to reducing the multiyear backlog of pending cases that encourages many to simply disappear rather than show up in court. Trump’s solutions will only mire the administration in more court battles, said Stephen Yale-Loeher, a law professor at Cornell University.